The Great Lakes Cruising Club (GLCC) holds several summer events for its members on the Great Lakes every year. 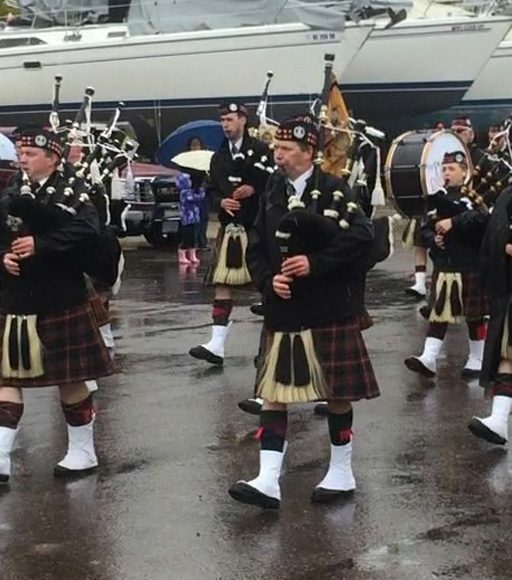 The events include picnic gatherings, rallies and one annual Rendezvous—generally in order of ascending size. It should also be convenient—if not necessary—to reach by boat. 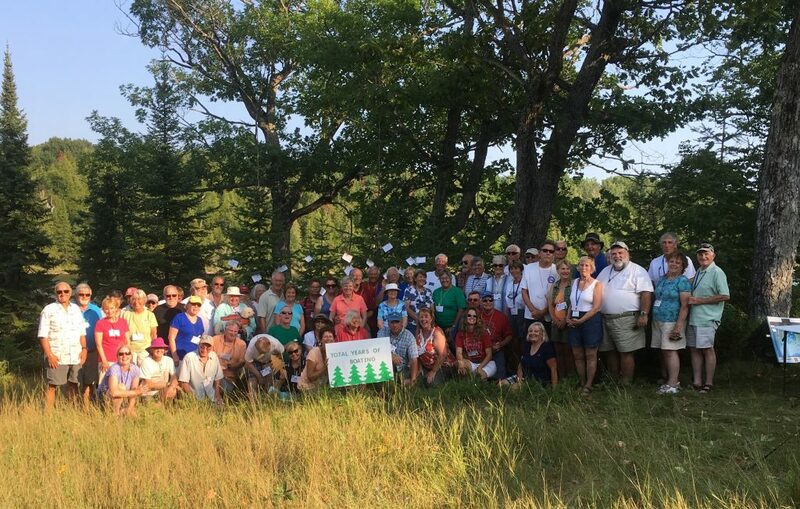 Our first summer GLCC event was a rally at Barker’s Island Marina in Superior, WI, in 2014. We motored Gaviidae over from Harbor Cove Marina in Duluth, had a great time and learned a lot about sailing cutter rigged sailboats from experienced hands. The event sealed the deal about joining and membership has yielded treasure troves of sailing knowledge, Great Lakes harbor and anchorage information and, perhaps most importantly, new friends. Last summer we hit the Rendezvous at Rogers City, MI and came away with memories we will savor and cherish for years to come. 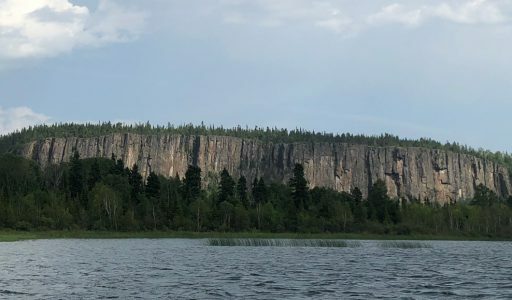 This summer we timed our passage from Lake Superior to Lake Huron to allow us to attend the GLCC Wilderness Rally at the west end of Lake Huron in Harbor Cove, which can be a dinghy ride from Drummond Island in calm seas. 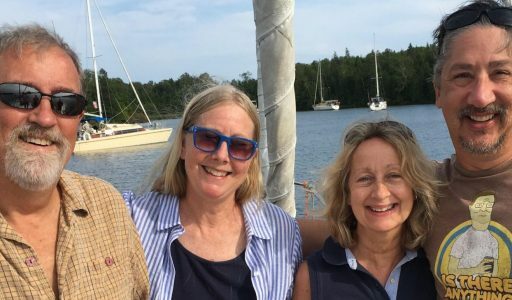 As Julie recounts in her blog about connecting with our friends from Minneapolis, we arrived in the area a few days ahead of time and spent a couple nights anchored in Harbor Cove before returning for the rally. Harbor Island itself is a horseshoe-shaped 750-acre wildlife preserve in Potagannissing Bay in the southwest corner of Lake Huron. (That’s pronounced “pah-tah-guh-NEES-ing.”) We arrived Tuesday, August 2, one day ahead of the official start of the 4-day event. We found a dozen or more GLCC boats already anchored in the 150-acre inner cove. Most of the rest of the boats arrived the next day. The harbor contained about upwards of 35 motor cruisers, tugboats and sailboats of all sizes, with room to spare. To kick things off, a “boat rules” happy hour was scheduled for Wednesday evening under the GLCC tent fly ashore. Boat rules require that each boat party bring their own refreshments and an appetizer to share. During his welcome to this meet-and-greet, GLCC Commodore Chuck Mead beckoned Julie and me to the center of the gathering under the tent. We were at a loss as to why we were summoned. The commodore related that he sailed to the Rendezvous in Superior, WI a few weeks before. He expected to find us there based on the roster of attendees. However, it was a different Gaviidae’s crew in attendance. At the time, Julie and I were at the opposite end of Lake Superior. Mead said he was relieved to finally track us down at Harbor Island. He then announced that we were the winners of the 2016 Founders Award for our 2015 blog, GaviidaeSails.com, and presented us with the formal letter announcing our win! Julie and I were stunned and thrilled by the news. GaviidaeSails is the first-ever blog either of us have worked on. Despite my nearly 40-year career as a magazine writer and editor, blogging was an alien and not-altogether-welcome form of communication. I made my bones as a long form writer and have chafed at the restrictions imposed on social media writing. I have avoided social media as a platform for my writing because of its history of uneven quality, little or no accountability and a lack of fealty to accuracy, reliability or truth. In addition, social media is notorious for not paying for work done. As I have written before, Julie dragged me to Facebook last year then pushed me into blogging a few months later on the site she created in a WordPress class. Now we’ve won an award for the blog! There’s still no money involved. I think we get a plaque—which we hope is small enough to display below decks on Gaviidae. Otherwise we might have to use it as a wind vane. Just kidding, it is an honor to receive the award. The first full day of the Wilderness Rally started with a pancake breakfast ashore followed by an informative and entertaining presentation about the Potagannissing Bay area by local resident Dave Bardsley. That afternoon, Julie and I entered the Blind Man’s Bluff Dinghy Challenge. This was a roughly 50-yard dinghy rowing race between and around boats. The challenge was that the rower in each dinghy was blindfolded, so he or she could not see where they were going—or even how fast! A couple years ago Julie and I worked out a touch system for rowing our dinghy. Our dinghy is set up for rowing as in a rowboat, the rower necessarily has to face backwards. Turning to see where the dinghy is heading invariably slowed the process and frequently caused the craft to veer off course. Verbal commands didn’t always work because Julie’s right—as she faced forward on the seat amidships—was my left. Even starboard and port directions get confused because while starboard and port are relative to the bow of the boat, the rower is facing the wrong way. To overcome these communication breakdowns, we developed a system where she would touch my shoulder on the side I should steer to. She would often leave her hand on that side until the correct direction was accomplished and would augment the signal with a “straight ahead” command. Speed was also dictated vocally. This system proved invaluable in the dinghy race. While the other seven dinghies were floundering at the start line, we surged out and developed a commanding lead. Or so I was told. The finale proved to be the trickiest part. 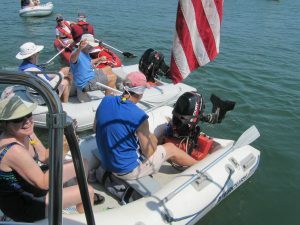 Rules require the blindfolded rower to grab a flag hanging from the dinghy davits at the finish line, which happened to be the commodore’s boat. The flag was high enough that I had to flail in the air overhead and the momentum of our arrival at the finish line propelled us beyond the stern of the boat—and beyond the flag. We had to do a 180 and charge back to the end of the boat. As we arrived, other dinghies were just arriving and beginning to flail for the flag. I powered into the melee, pushing aside three dinghies then managed to grab the flag this time around. We won! Now if we had been thinking, we should have fired up the dinghy motor and done a victory lap around the bay with that flag flapping. As it was, we did a tour of the shoreline, but Julie didn’t come up with the idea of the victory lap until several minutes into the tour. Maybe next time. That evening before the Coney Dog Dinner ashore, we were presented with a small cutting board for winning the dinghy race. The jig-sawed board is shaped like a pine tree—the symbol for the Wilderness Rally. 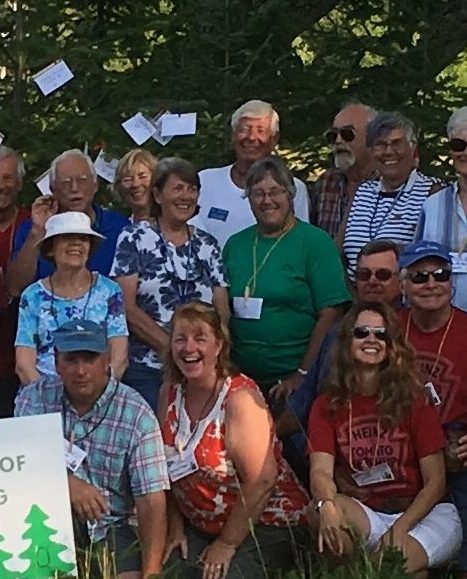 The Coney Dog Dinner is an annual event at the Wilderness Rally held to commemorate Bud and Shirley Zalon, longtime GLCC members who helped launch the rally. Bud was an aficionado of Coney Dogs and started the custom. Bud and Shirley are no longer able to sail and sold their Gozzard 36 a couple years ago. Julie and I were fortunate enough to meet them at the Rogers City Rendezvous last year and had them aboard Gaviidae for a brief visit. It was an emotional and nostalgic moment for them to come aboard and go below decks. Julie and I were touched by their joy at being aboard a Gozzard again. 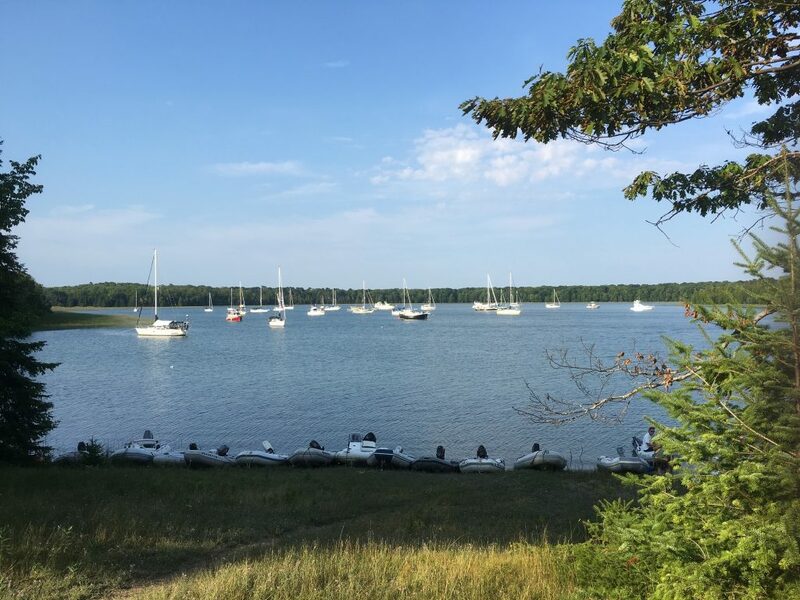 Among the remaining events and activities at the Wilderness Rally was a poll to determine the aggregate years of boating among all the attendees. Rally participants’ boating experience totaled nearly 3,000 years! Other activities included an ice cream social sponsored by Drummond Island Yacht Haven at their marina. The original plan was for rallyers (yes, I just coined a new word) to dinghy to Drummond Island. High winds made that impractical, so the marina shuttled boaters to and from Drummond Island. The rally wrapped up with a potluck dinner Saturday night. 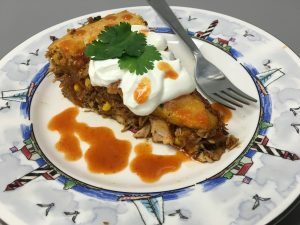 We brought a Tex-Mex chicken and cornbread casserole I prepared in a cast iron pan. Our dish was a hit and disappeared in short order. Click here for the recipe. All in all the Wilderness Rally was a great time and we met some wonderful people. Other than some wind on Friday, we had great weather. In addition, the cool water in the bay was a welcome contrast to the cold water found in most of Lake Superior. Like other GLCC events, the Wilderness Rally is organized by members who work as a committee to plan, prepare and execute the event. This year’s Wilderness Committee was co-chaired by Bill and Sandi Matley. The committee included Mel and Sue Durchslag, Jim and Linda Williams, Melissa Spillenkothen and Lou and Laurel Bruska. Organizing and staging one of these rallies takes a lot of time and effort. Kudos to the crew that pulled off the 2016 Wilderness Rally.